Lionel Messi and Luis Suarez might have been rested but instead both played and scored as Barcelona came from behind to beat Rayo Vallecano on Saturday, ahead of their crunch Champions League second leg against Lyon. 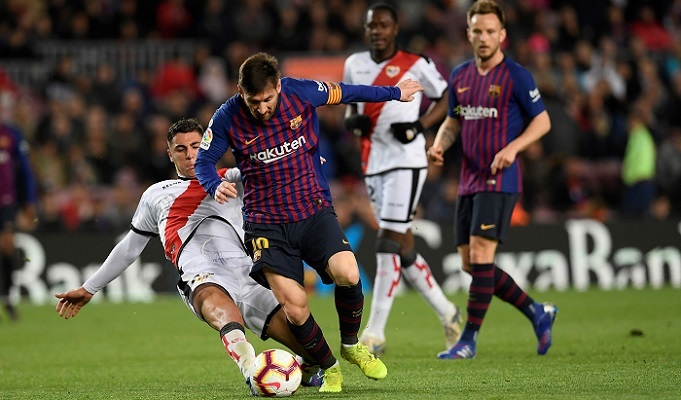 Raul de Tomas' scintillating strike gave struggling Rayo a surprise lead at the Camp Nou but Messi converted a penalty and Suarez finished a brilliant passing move to seal a 3-1 win, after Gerard Pique had headed in an equaliser. When Barca kicked off, Atletico Madrid had just completed their own 1-0 victory over Leganes, although Diego Simeone was more cautious, resting Antoine Griezmann, Alvaro Morata and Saul Niguez, with Tuesday's trip to Juventus in mind. There was always a risk that La Liga's top two might take their eye off the ball, given Barcelona's last 16-tie with Lyon hangs in the balance after a goalless draw in France, while Atletico hold a 2-0 lead over Juve but can expect an onslaught in Turin. Yet both avoided slip-ups to leave Real Madrid even further adrift before they play away at Real Valladolid on Sunday. Barca stay seven points clear of Atletico and, temporarily at least, move 15 ahead of Real. Even with a two-goal cushion for the final eight minutes, Ernesto Valverde kept Messi and Suarez on until the end, which may have surprised some, given he was accused of burning out star players last season at the expense of their success in Europe. Messi's appearance was his 443rd for Barcelona in La Liga, moving him ahead of Andres Iniesta and behind only Xavi Hernandez, on 505, in the club's all-time list. Samuel Umtiti started only his second match in three months after recovering from a knee injury and looks to be regaining sharpness, but Philippe Coutinho was underwhelming again, despite being picked ahead of Ousmane Dembele. He poked an early chance wide after a Messi cross and De Tomas put Rayo in front soon after, driving at Pique before unleashing a sizzling shot past Marc-Andre ter Stegen. Pique headed one Messi free-kick wide and then another one in at the near post, nipping in front of Rayo goalkeeper Stole Dimitrievski to nod in his sixth goal of the season. Dembele came on for Arthur Melo at half-time and Coutinho dropped deeper, but it was right-back Nelson Semedo that earned the penalty, after a foul from Jordi Amat. Messi made no mistake. Rayo's belief, and energy, melted away and Barca's third was their best of the night. Suarez freed Dembele down the right and he found Suarez again with a pull-back. Instead of shooting, Suarez bounced the ball off Ivan Rakitic in the area before finally tapping home. There was nothing as free-flowing at the Wanda Metropolitano where perhaps the greatest show of creativity came from Leganes, whose players wore shirts with the name of their mothers on their backs to celebrate International Women's Day on Friday. The first half was almost entirely forgettable but despite the absence of attacking punch, Griezmann came off at half-time for Thomas Lemar, with no visible sign of an injury. Griezmann would have taken the penalty soon after, won by Angel Correa with some quick feet in the area, which lured Kenneth Omeruo into a clumsy challenge. Saul stepped up and missed, but tucked in the rebound after Andriy Lunin could only push the ball back into his path.